Right, as the world goes, is only in question between equals in power, while the strong do what they can and the weak suffer what they must.” This sentence from the History of the Peloponnesian War by Thucydides is the philosophy of Donald Trump’s administration. Thus, two of his advisers, HR McMaster and Gary Cohn, wrote in May that: “The world is not a ‘global community’ but an arena where nations, non-governmental actors and businesses engage and compete for advantage.” This amoral perspective has serious implications. In no area are global spillovers more significant and co-operation more vital than climate. The failure to act ensures that the poor would indeed suffer. This is the conclusion of a chapter on the economic impact of weather shocks, in the International Monetary Fund’s latest World Economic Outlook. The largest negative impacts of the shocks being made more frequent by global warming are on tropical countries. Nearly all low-income countries are tropical. Yet these countries are the least able to protect themselves. Thus they are innocent victims of changes for which they bear no responsibility. In assessing these risks, one has to start from the proposition that anthropogenic global warming is a reality. The intellectual industry devoted to denying this is well-funded and noisy. But its arguments are highly unconvincing. The underlying physics are undeniable. Furthermore, the empirical connection between rising concentrations of greenhouse gases and temperature is unambiguous. If little or no action is taken, average temperatures could rise by 4°C, or more, above pre-industrial levels by the end of the century. Aware of the lengthy lead times needed if effective action is to be taken, both to mitigate climate change and adapt to it (where inescapable), rational people would act now. The main obstacles to such action are three. First, specific economic interests, notably in the fossil fuel industry, are understandably opposed to action and, not infrequently, to the science that suggests it is necessary. Second, free-marketeers, who despise both governments and environmentalists, reject the science, because of its (to them) detestable policy implications. Third, few wish to inconvenience themselves, let alone threaten their standard of living, for the sake of the future, or people in poorer countries. So what is the evidence of the impact on the poorest of failure to act? The IMF authors start from our knowledge that higher temperatures make a range of weather-related disasters more likely because there will be more energy in the weather system. Such effects will include a greater frequency of — and greater damage done by — cyclones, floods, heatwaves and wildfires. Furthermore, the increased frequency of extreme events will also do relatively more damage to the poorest countries. This is so for two reasons: these countries are located in the regions of the world most likely to be adversely affected; and they are least able to protect themselves against, or manage, the impact. For the median low-income developing country, with an average temperature of 25°C, the effect of a 1°C increase in temperature is to lower that year’s growth by 1.2 percentage points. Moreover, the impact is long-lasting. These costs come from the adverse effects of heat on productivity, agricultural output, health and even conflict. Extreme heat is costly. Adaptation to extreme weather remains very hard for poor countries. We have witnessed this autumn the far more damaging impact of huge storms on poorer countries, such as those in the Caribbean, than on the much wealthier US. It is possible for well-managed nations to reduce these adverse impacts. Countries with superior infrastructure, better-regulated capital markets, flexible exchange rates and more accountable and democratic institutions recover faster economically from the adverse impact of temperature shocks than others. Hot regions in high-income countries also cope better than those in poorer ones. All this supports the view that the poorest countries are likely to be the most damaged by rising temperatures. The populations of such countries are more vulnerable because they are closer to subsistence. With the temperature increases projected by 2100 under unmitigated climate change, annual real incomes per head of a representative low-income country would be 9 per cent lower than they would otherwise be. This would impose large costs on their vulnerable groups. Moreover, such a forecast ignores the risks and uncertainties around any such estimates. A planet 4°C warmer than the pre-industrial average would be so different from the one we are now used to that the implications are in significant part unknowable. The IMF’s analysis has a number of serious implications. First and most important, low-income countries need to develop quickly to be better able to cope with weather shocks. Second, their development needs to be consistent with mitigating the rise in global temperatures. Third, we need rapid improvements in the relevant technologies and their swift dissemination. Fourth, we also need to help poor countries adapt to the changes in climate already sure to happen. Fifth, we need to develop insurance against weather-related shocks to poor countries. Finally, a moral case also exists for compensating losers from the costs of the unmitigated climate changes being imposed by richer countries. We should not let the urgent stop us from thinking about the important. The linked challenges of climate and development will shape humanity’s future. But in case the worst happened, China developed a fallback strategy. It began producing a new class of high-tech products. It also had to find new markets outside the U.S. The economic solution posed a military problema. On the first trading day of 2016, China’s central bank sent shockwaves around the world by sharply lowering the value of the yuan. The decline in the currency itself, which came after the bursting of a stock market bubble, was not the biggest concern. Rather it was a sudden loss of confidence in China’s growth story that reverberated around the world. No matter how closed China’s financial system is, the country’s heft as the world’s second largest economy, as the biggest buyer of nearly all commodities and as the biggest exporter means what happens in China won’t stay there. How the ripples of China’s actions played out over the next several weeks shows what could happen if the country’s dependence on borrowing to fuel growth hits a wall. China’s stock market plummeted, pulling the S&P 500 down 11% from the start of the year to Feb. 11, when it bottomed. Oil and other commodities fell harder, with West Texas crude falling to $26 per barrel the same day. Currencies of commodity-producing nations like Australia and Brazil were hit. Saudi Arabia’s currency peg to the U.S. dollar came under speculative attack. Commodity trading houses like Switzerland’s Glencore and Hong Kong’s Noble Group faced investor fears over their solvency. This turmoil had knock-on effects on financial companies. Banks that made loans to oil drillers and miners looked exposed to defaults. The prospect of lower growth in China and commodity-producing emerging markets sent global interest rates lower, impairing banks’ profit margins. In the U.S. banks were among the hardest hit sectors, with the KBW Nasdaq Bank index falling 23% by February 11. No two crises are exactly the same, and China is unlikely to allow its domestic stock market to become so stretched again. But if the Federal Reserve keeps raising interest rates, it could put renewed downward pressure on the yuan. The country’s new capital controls haven’t been tested by a big shock either. China’s shadow banking system has grown dramatically, so any attempt to rein it in, or any breakdown in the byzantine chain of wealth management products, could threaten Chinese growth and send cash flowing out of the country. A Chinese financial crisis likely wouldn’t play out like the U.S. housing bust, which caused the worst global recession in decades. But China’s stumble in early 2016 didn’t require the collapse of a complex financial product or the failure of a major bank to hit markets around the world. The combination of plain old commodities and leverage were enough to spread the damage. Anyone searching for ground zero of the next crisis should look closely at how a crack in China’s growth story could be transmitted globally. BRUSSELS – Just four months ago, when the Europhile Emmanuel Macron was elected as France’s president, it seemed that the European Union could finally look forward to a period of calm. But calm is the last thing one can see on the streets of Barcelona, where demonstrations in favor of Catalonian independence – a referendum on which was brutally suppressed by government forces – have been met with equally potent protests against it. As Spain’s internal conflict escalates, a return to crisis in Europe may seem all but inevitable. Yet what is happening on the ground in Spain actually indicates that the European economic recovery is strengthening, while highlighting the limits of what the EU can achieve. The strength of the EU’s economic recovery is revealed by the absence of any significant financial-market reaction to the tumultuous scenes in Catalonia. Had a similar situation arisen a few years ago, there would have been a run on Spanish government bonds, and Spain’s stock market would have tanked. Today, however, markets are taking the country’s profound political uncertainty in stride. This vote of confidence is built on solid foundations. The entire eurozone economy is growing at respectable, albeit unspectacular, rates. And the Spanish economy has been growing faster than the eurozone average, all while keeping its external accounts in slight surplus. This means that Spain’s recovery is based on increasing supply, rather than rising domestic demand, as was the case during the pre-crisis construction boom. 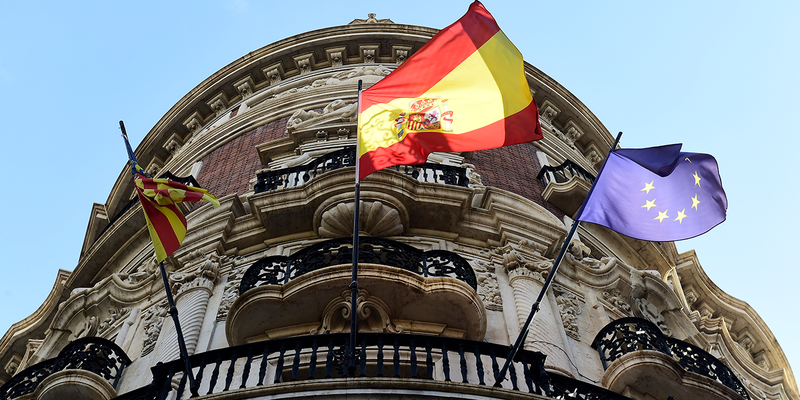 Add to that the existence of eurozone institutions that can address temporary financing difficulties faced by banks or states, and it becomes clearer why Spain’s deep political crisis has not been accompanied by dangerous financial-market gyrations. But the Catalonia crisis also underscores the limitations of the EU’s model of integration, which are rooted in the fact that the Union is ultimately based on the nation-state. This model cannot be described as inter-governmental. Rather, it is based on indirect implementation: almost everything the EU does and decides is carried out by national governments and their administrations. This distinction can be seen most strikingly in the area of monetary policy, where the decision-making mechanism is definitely not intergovernmental: the European Central Bank’s Governing Council operates on the basis of a simple majority. But the implementation mechanism is certainly indirect: once a decision is made, it is carried out by national central banks – an approach that can have important implications. For example, the vast bond-buying operations nominally undertaken by the ECB in recent years have been handled largely by national central banks, which purchase their own governments’ bonds. The European Court of Justice in Luxembourg – another common institution of crucial importance – also relies on a decision-making mechanism that is not inter-governmental. Yet its judges are nominated by national governments, and national courts and administrations enforce its decisions. A comparison with the United States highlights the weaknesses of this approach. While the US Federal Reserve also has a regional structure, the individual District Reserve Banks cover several states and aren’t tied to any state government or institution. Likewise, US Supreme Court justices are nominated by federal institutions (the Senate accepts or rejects nominees put forward by the president), not by state governments. For the EU, relying on its member states to build common institutions was arguably the only way to start the integration process, given deep mistrust among countries that had fought so many brutal wars against one another. And yet a union that relies on the nation-state, not just for implementation, but also for legitimacy, can function only as well as its individual members. But, today, with most of them are beset by internal strife, that model is reaching its limits. In Greece, weak administrative and judicial systems have impeded economic recovery. In Poland and Hungary, “illiberal” governments are undermining judicial independence. And in Spain, the political system seems incapable of resolving the conflict between the regional government of Catalonia, with its aspirations of greater self-determination, and the central government in Madrid, which argues that even considering the question would undermine the constitutional order. Even Germany is facing internal political challenges. Having lost about one-fifth of her voters in the recent federal election, Chancellor Angela Merkel will have to reckon with three unruly coalition partners during her fourth – and probably last – term. As for Italy, opinion polls suggest that a majority of voters now support populist and/or Euroskeptic parties. While outright Euroskeptic parties appear unlikely to gain power anywhere, these political shifts do not bode well for European integration. The EU faces little outright hostility. Today it is facing, instead, an “obstructionist indifference,” as many of its member states are increasingly preoccupied with their internal challenges, making European integration little more than a second thought throughout most of the continent. Those EU leaders who do still want to advance integration can no longer count on the argument, used during the financial crisis, that there is no alternative. And the permissive consensus of the first years of integration is long gone. If further progress toward “ever-closer union” is to be made, Europe’s leaders will have to find a new model that can overcome their citizens’ deepening apathy.